Fibonacci and Fractals, OH MY! As the sub heading of this blog says “This is where I write to figure out what I think”. This post may be more about the “What do I think?” exercise than usual so please bear with me. It is not my purpose to stray too deep into this subject but there are some very interesting quirks that exist in our world. When I am done my hope is that the reader will be all the more convinced of the wisdom of considering the 7 and 50 rhymes (i.e. the biblical moedim) in their decision making. I want to introduce two subjects Fibonacci numbers and Fractals. In the world of mathematics, the Fibonacci sequence is created by adding consecutive numbers as shown below. 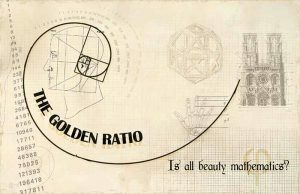 Interestingly this creates what is called the golden mean ratio which is approximately 1.618034… Calculated by taking any of the, double digit or greater, numbers in the sequence and dividing it by the number just previous to it. Fractals are infinitely complex patterns that are self-similar across different scales. They are created by repeating a simple process over and over in an ongoing feedback loop. Anyone who studies Fibonacci numbers will quickly run into Fractals, likewise anyone who studies Fractals will soon be considering Fibonacci numbers. This picture of a snail shell is an example of multiple fractals in nature. Notice that each segment in the snail shell appears to have a very similar shape. These are fractals which repeat themselves over and over creating the shell. Each segment stands alone and yet is part of the whole. 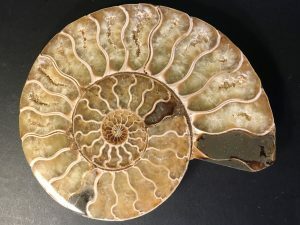 Fibonacci numbers seem to be the Fractals of the numbers world, a numeric way to express the idea of multiple Fractals creating a whole such as this shell. So why is this important to 7 and 50 rhymes? For many years technicians (people who study price charts of stocks and commodities) in the world of finance have recognized these patterns on price charts moving across time. There is a plethora of theory how to use these patterns. I think the 7 and 50 rhyme is evident in the Fibonacci sequence in a very unique way. Consider first how our natural world functions in regards to time and the Fibonacci numbers. The Lunar cycle is 29-30 days, 34 is a Fibonacci number. The Annual cycle of the earth around the sun, the year is 365.25 days, 377 is a Fibonacci number. The Year is also approximately 12.37 Lunar cycles, 13 is a Fibonacci number. Why do these numbers all seem to get close to the next Fibonacci number but reach a completion before overtaking the next number in the Fibonacci sequence? Here is my theory: I expect that our world is established using these completion or rest points just before the next Fibonacci fractal as a means of keeping things stable. When a new fractal takes shape at the end of each Fibonacci number, I expect a shaking or lack of stability takes place. I expect the Creator set things up as they are so that stability would exist here on earth. Thus by having segments of time end just before the next Fibonacci number of time, stability is created. Watch what happens when we enter the biblical appointed times (the Moedim) into the mix. Consider the Biblical 7- day week, the 7- year cycle and the 7 sets of 7 years, Notice the proximity of 7 to the Fibonacci number 8. Seven is just one-digit short of the number eight. As we extend the idea a pattern develops which seems to not be a coincidence. The 7- year biblical cycle creates 86.59 Lunar cycles in 7 years, 89 is a Fibonacci number. 2556.75 days in 7 years, 2584 is a Fibonacci number. It becomes clear why these resets are important when one moves on the 50-year cycle. The 50- year biblical cycle creates a bust or overage. But watch what happens when we look at the 7 by 7 years i.e. 49 years. When we take into account weeks and moons a very close short fall shows up. 49 years when counted in days is 17,897.25 which is over the Fibonacci mark of 17,711 by 186 days. Seemingly telling us how important it is to pay attention to the 7 day week the lunar cycle and the instructions for the 7 year reset. This count of 49 years worth of days might also explain why a count of 50 years is proscribed. Offering the extra, 50th year as additional protection and stability at this very vulnerable point in time as 17,711 days will be reached just over midway through the 49th year, the 50th year then would be the safety of a full year before a new count begins. The Economic rests of 7 days, 7 years and 7 sets of 7 years including the additional 50th year seem to be a way of stabilizing an economic system. Ignoring this instruction will likely in time lead to an economic event reminiscent of Noah’s flood. Our natural world appears to be designed to reach certain points in the growth cycle where a death or completion of the old takes place and a beginning of the next segment forms. I expect the same is true in our economic world. The biblical instructions about time seem to put the observer of biblical timing in a safe place at these dangerous transition points. It appears to this author that even a simple study of Fibonacci Numbers and Fractal Images in nature when compared to the Biblical Timing instructions, reveals this powerful truth.